Unique apartment with great amenities close to everything! 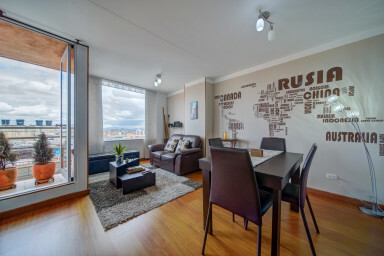 This unique home will allow you to feel at home, combined perfectly with all the necessities for a comfortable stay in Bogotá. The building has complete gym, supermarket, cafe & bakery, banks, sauna & Jacuzzi (the last ones have an extra cost). The Sofa in the office converts into a bed for additional guests. You will have access to everything in the apartment. It will be your home away from home. The apartment is located in Chapinero Alto (Calle 48a # 6 – 44, Edificio Toledo), one of the most central and exciting neighborhoods in Bogotá. It is a culturally diverse hot spot, full of nightlife, commerce, and universities, a definite favorite among visitors to Bogotá. Building features: Gym, BBQ area, Communal living room, elevator, 24 security, parking, Sauna, Jacuzzi. 10 meters from Carrera 7. 3 minute walk to Marly Clinic. 3 minutes walk to "Hospital Militar"
5 minutes taxi ride to Zona G – the best gourmet zone of Bogotá.